The Painted Palette Fine Art Studio and Gallery is a place to learn the principles of painting, always striving to enrich the students' knowledge. 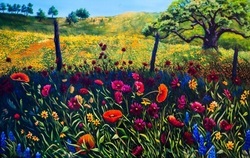 Texas Hill Country by Patricia Reed, oil on linen, 36"x48", all rights reserved by artist. Sold. Welcome to the Painted Palette Art Studio! A new adventure awaits you when you enroll in the oil/acrylic painting classes. Students who are new to painting will learn the basic fundamentals of painting beginning with the study of color, value relationships, and composition. Class begins with constructive critique and direction of each students work. For the more seasoned painter, classes are designed specifically to meet their creative requirements. Our small class size is conducive for teacher/student discussions which help students learn and progress more effectively. No student is left with the uncertainty of how to proceed and questions are always welcome.